Clips of Michael Bennett losing to EC3 in the “Bound for Glory Playoffs.” Also clips of James Storm and Bobby Lashley. EC3 heads to the ring. He’s on a quest to be the best. A quest to be the best… a quest to be the best. He’s bound for glory. Then Bobby Lashley comes out. 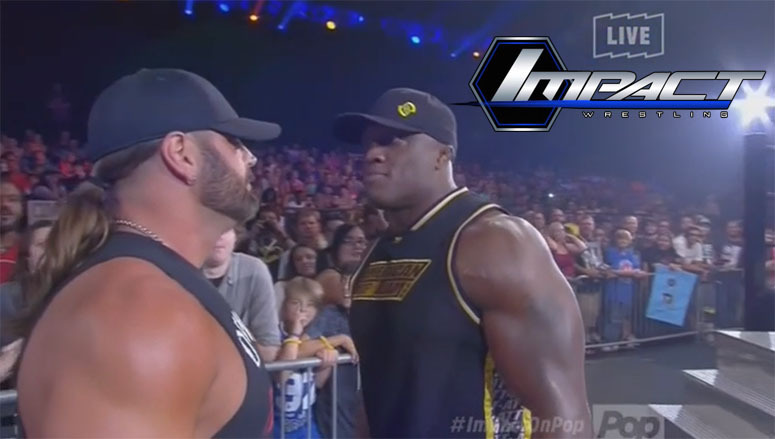 Lashley tells EC3 that he isn’t the best. Lashley is the best. Because he beat up the X-Division and EC3’s friend. EC3 isn’t the man to beat him. EC3 says Lashley is the best in the world. He’s a force of nature. Lashley agrees. Then James Storm comes out. Storm respects EC3, but tonight is his night. He then calls out Lashley and challenges him to a fight. Lashley takes a swing but misses. Then they brawl to the back. In the ring, Michael Bennett and Moose attack EC3. Eddie Edwards then tries to even the odds. He is successful, and he and EC3 clear the ring. Pretty good match. It was a little chaotic and didn’t have a lot of flow, but it was a fine match. After a while there wasn’t much of a tag match, it was just four guys fighting, which is fine. James Storm remembers becoming TNA Champ five years ago. Aron Rex (the former Damien Sandow) makes his Impact debut. He tells the truth by saying that he was “too entertaining” to compete for world titles in certain companies. Some people are preordained to receive opportunity, and there are others that seize opportunity when on a level playing crowd. TNA is where you succeed on talent alone. He will realize his full potential. He will change the template of the industry. As Maria (with Allie) tells Gail Kim that she’ll have a no DQ match tonight, Marti Bell attacks. Eddie Edwards is upset with Michael Bennett for screwing up his career. Bennett tells Edwards that he earned the loss. Edwards challenges Bennett to a match, but Bennett gives Edwards a match with Moose instead. An okay match. There was barely a need for the no DQ rule, though Maria did try to use it to gang up on Gail towards the end of the match. Otherwise this match was fairly unremarkable. After the match, Gail Kim is attacked by Marti while Allie and Maria watch. Jade comes out to help Gail (and misses a spin kick on her first attempt). Maria is angry, so she makes a match between Jade and Gail Kim for next week. James Storm talks about being dirt poor and talking to his mom after winning the world title. Matt Hardy will eat and delete those who question his broken existence. He had a premonition last night of Decay abducting his son. They will never get their hands on his son, but Hardy will get his hands on the tag titles, thanks to his brother. Jeff Hardy comes out. He asks Matt why he bit part of a man’s of a face off. He thinks Matt is afraid. He doesn’t think people want to see a broken Matt Hardy, they want to see the Hardy brothers together like they used to be. Matt disagrees. Al Snow comes out with Basile Baraka and Baron Dax and tells Matt that he needs to find some real talent. Dax says The Tribunal is upper-class. Baraka says Matt is smart (in French). This was actually pretty entertaining. What started as a handicap match (since Matt refused to participate) turned into a singles match when Matt decided to beat the crap out of Dax at ringside with his boot. Matt also bit Al Snow’s finger and hypnotized a fan at ringside. The match itself was pretty blah, but the antics of Matt Hardy made it fun. Matt sort of compliments Jeff, then Jeff does a bunch of Twists of Fate. Matt smiles. Jeff then puts Al Snow though a table with a plancha. He then puts himself through a table with a swanton, because the only person that can punish Jeff is Jeff. Matt laughs. Jeff also laughs and says he is Brother Nero. Jeff is broken. Bobby Lashley tells Dixie Carter and Billy Corgan that he knows what they’re doing with the James Storm videos. Billy says they offered Lashley the same deal but he refused. Lashley says he does his talking in the ring. Rosemary says that you are never in control with Decay. Abyss is beautiful because of Decay. Crazzy Steve hears voices. Drew Galloway heads to the ring. He hasn’t been on Impact lately because of his state of mind. Also, he’d go to jail if he acted like he wanted to. He’s still upset about EC3 screwing up his title opportunities. He calls EC3 a “snake in the grass.” He accuses him of trying to sabotage his career. Galloway proposes a solution: a match with EC3 to determine who main events Bound for Glory. James Storm talks about the naysayers. Good match. I felt like they might end this match with a DQ, but they didn’t. After the match, Aron Rex comes out and stares at the man who holds all the singles gold in TNA. Not a bad show. I was mostly entertained. I feel like they could have had more matches and less talking (since a lot of the talking seemed redundant or went on too long), but overall I think it worked out okay. I like seeing Aron Rex, but I think pushing him to the top right away might be a little too fast. Let him work his way there. It’ll lengthen his run in the company. It was a fine match, and the added weight of all the gold made it feel important, though maybe not as important as it should be. Even with the James Storm videos, the upcoming PPV title match felt like it was given more weight. Still, this match was good and had some nice emotion to it.